"Our political elites, Republican and Democrat, were shaped, funded and largely selected by corporate power"
Thomas Frank’s marvelous scorched-earth assault on the Democratic Party and professional elites in his book “Listen, Liberal: Or, What Ever Happened to the Party of the People?” has one fatal flaw. Frank blames the liberal class, rather than the corporations that have seized control of the centers of power, for our descent into political dysfunction and neofeudalism. Yes, self-identified liberals such as the Clintons and Barack Obama speak in the language of liberalism while selling out the poor, the working class and the middle class to global corporate interests. But they are not, at least according to the classical definition, liberals. They are neoliberals. They serve the dictates of neoliberalism—austerity, deindustrialization, anti-unionism, endless war and globalization—to empower and enrich themselves and the party. The actual liberal class—the segment of the Democratic Party that once acted as a safety valve to ameliorate through reform the grievances and injustices within our capitalist democracy and that had within its ranks politicians such as George McGovern, Gaylord Nelson, Warren Magnuson and Frank Church and New Deal Democrats such as Franklin D. Roosevelt—no longer exists. I spent 248 pages in my book “Death of the Liberal Class” explaining the orchestrated corporate campaign to erase the liberal class from the political landscape and, more ominously, destroy the radical labor and social movements that were the real engines of social and political reform in the 19th and 20th centuries. The Democratic and the professional elites whom Frank excoriates are, as he points out, morally bankrupt, but they are only one piece of the fake democracy that characterizes our system of “inverted totalitarianism.” The problem is not only liberals who are not liberal; it is also conservatives, once identified with small government, the rule of law and fiscal responsibility, who are not conservative. It is a court system that has abandoned justice and rather than defend constitutional rights has steadily stripped them from us through judicial fiat. It is a Congress that does not legislate but instead permits lobbyists and corporations to write legislation. It is a press, desperate for advertising dollars and often owned by large corporations, that does not practice journalism. It is academics, commentators and public intellectuals, often paid by corporate think tanks, who function as shameless cheerleaders for the neoliberal and imperial establishment and mock the concept of independent and critical thought. The Democratic and the professional elites are an easy and often amusing target. One could see them, in another era, prancing at a masked ball at Versailles on the eve of the revolution. They are oblivious to how hated they have become. They do not understand that when they lambast Donald Trump as a disgrace or a bigot they swell his support because they, not Trump, are seen by many Americans as the enemy. But these courtiers did not create the system. They sold themselves to it. And if Americans do not understand how we got here we are never going to find our way out. During Barack Obama’s administration there has been near-total continuity with the administration of George W. Bush, especially regarding mass surveillance, endless war and the failure to regulate Wall Street. This is because the mechanisms of corporate power embodied in the deep state do not change with election cycles. The election of Donald Trump, however distasteful, would not radically alter corporate control over our lives. The corporate state is impervious to political personalities. If Trump continues to rise in the public opinion polls, the corporate backers of Hillary Clinton will start funding him instead. They know Trump will prostitute himself to money as assiduously as Clinton will. Lewis Powell, then the general counsel to the U.S. Chamber of Commerce, in August 1971wrote a memo called “Attack on American Free Enterprise System.” It became the blueprint for the corporate coup. Powell would later be appointed to the Supreme Court. Corporations, as Powell urged, poured hundreds of millions of dollars into the assault, backing candidates, creating the Business Roundtable, funding The Heritage Foundation, the Manhattan Institute, the Cato Institute, Citizens for a Sound Economy, and Accuracy in Academia. The memo argued that corporations must marginalize or silence those who in “the college campus, the pulpit, the media, and the intellectual and literary journals” were hostile to corporate interests. Powell attacked Ralph Nader and called for a concerted campaign to discredit him. Lobbyists eager to dole out huge sums of cash flooded Washington and state capitals. It soon became difficult and often impossible, whether in the press, the political arena or academia, to challenge the dogma of neoliberalism. Once corporate money started to pour into the Democratic Party in the early 1970s, legislation that sought to check or regulate corporate power—the auto and highway safety laws, oil pipeline safety laws, product safety laws, the revised Clean Air Act, the Occupational Safety and Health Act and the measure that established the Environmental Protection Agency—was no longer possible. The Democrats began to compete with the Republicans to propose legislation that would provide tax loopholes for corporations. Such legislation now legally permits oligarchs such as Trump and corporations to engage in a de facto tax boycott. The system, designed to exclusively serve corporate power, fell into political paralysis. The consent of the governed became a joke. Labor, which once put about one in every four dollars into the Democratic Party, was sidelined as a political force. The corporate campaign of union busting, deregulation, automation and off-shoring of jobs accelerated. And the class of faux liberals, such as the Clintons, played its assigned role, speaking in the old language of liberal values while betraying working people. “[Bill] Clinton was an enemy of environmental, consumer, and worker issues,” Nader said. “He broke the modest welfare system for single moms. He sold out to the agribusiness companies. He allowed huge mergers in a bill he signed for the communications and the media giants, all in 1996, and this was quite apart from bombing Iraq illegally, killing civilians. He never opposed a swollen military budget that was unauditable. Those agencies tasked with protecting the citizen from corporate abuse were consciously underfunded or turned over to corporate-approved staff members. Politics, like very other aspect of American life, was commercialized. Everything, from public lands to politicians, was now for sale. Out of this rot and corruption, as it always does, arose a class of privileged elites who wallow in self-adulation and will do anything to further their personal self-advancement. 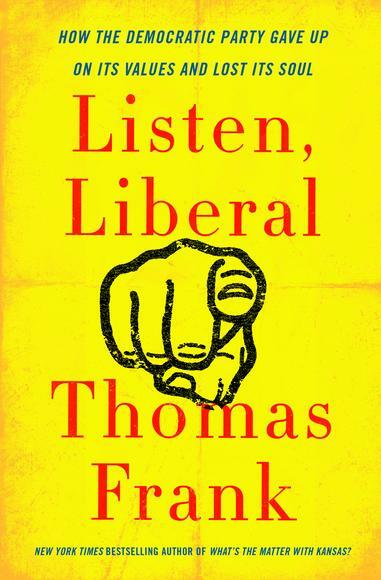 Thomas Frank, who is a gifted writer and reporter, peers into the hermetic and exclusive world of the professional Democratic power elite—the vacations in Martha’s Vineyard, the hipster innovation districts for budding tech entrepreneurs in cities such as Boston, the Ivy League pedigrees, the open disdain for the working class and the blind faith in a functioning meritocracy. The elites believe they are privileged, Frank writes correctly, because they are convinced they are the smartest, most creative, most talented and hardest working. They cap this grotesque narcissism, he points out, with a facade of goodness and virtue. They turn their elitism into a morality play. In Frank’s book there is a wonderful depiction of an event called No Ceilings, held in March 2015 on the day after International Women’s Day and sponsored by the Clinton Foundation at New York City’s Best Buy Theater (now the PlayStation Theater). The participants spent most of the time gushing over each other and uttering vague and amorphous calls for innovation and empowerment that have become to economic advancement what phrenology once was to science. They, like all other courtiers, cannot distinguish between reality and the masquerade. “This is not politics,” Frank writes. But Frank fails to grasp that, as C. Wright Mills understood, the Republican and the Democratic elites, along with our financial and corporate elites, are one entity. They are formed in the same institutions, run in the same social circles and cross-pollinate like bees. This has been true since the country’s formation. Harvard and Yale were designed, like Oxford and Cambridge in Britain, to perpetuate the plutocracy. They do an admirable job. Hillary Clinton sat in the front row for Donald Trump’s third wedding. And Chelsea Clinton, living in a multimillion-dollar penthouse in New York City, was until the current presidential campaign a close friend of Ivanka Trump. George W. Bush, although doltish and inept, graduated from Andover, Yale and Harvard Business School. His appointees were no less steeped in elitist Ivy League credentials than those around Bill Clinton or Barack Obama. Paul Wolfowitz attended Cornell and the University of Chicago. Donald Rumsfeld went to Princeton. Henry “Hank” Paulson graduated from Dartmouth and Harvard Business School before working for Goldman Sachs. Lewis “Scooter” Libby went to Yale and Columbia Law School (as well as the pre-prep school that I attended). Joshua Bolten, a chief of staff for President George W. Bush, went to Princeton and Stanford Law School. I, like Frank, have no affection for liberals. They are, and have always been, a smug, self-absorbed group who talk eloquently, even passionately, about justice and equal rights until their own privileges and sense of entitlement are questioned and threatened. They supported Martin Luther King Jr., for example, as long as he confined his struggle to integration. They abandoned him when he began to call for economic justice. But to blame liberals for our corporate system of “inverted totalitarianism” is ridiculous. They saw what had to be done to serve the centers of power, and they obliged. Those liberals with integrity, those who actually believed—as McGovern did—in reform and a liberal democracy, have been pushed out of the political system. Contrary to what Frank asserts, the Democratic Party was never the party of the people. It functioned, at best, as a safety valve during periods of discontent. It made possible modest reforms. It was tolerated by the elites because it set the limits of dissent. It permitted a critique of the excesses of the system but never a critique of capitalism, the structures of power or the supposed virtues of those who exercise power. Noam Chomsky has amply elucidated the role of liberals in a capitalist democracy. The liberal class is used to discredit radicals, like Chomsky, and radical movements. It carries out reforms, which are often later revoked, when capitalism extracts too much blood or when it breaks down as it did in the 1930s. Roosevelt did not institute Social Security and public works projects, create 12 million jobs or give legal status to labor unions because he and other oligarchs cared about the working class. They enacted socialist reforms because—and we know this from Roosevelt’s private correspondence—they feared revolt or, in Roosevelt’s precise word, “revolution.” They established the New Deal programs in order to save capitalism, which Roosevelt later said was his greatest achievement. They realized they would have to give up some of their money; it was that or risk losing all of their money. And they allowed the New Deal to be born because they felt the growing pressure of radical movements such as those of the socialists and communists. Politics is a game of fear. And if you lose the capacity to make the power elites afraid, you become their plaything. This, in the simplest terms, is what has happened to us. One of Frank’s most misguided attempts to pin our debacle on liberals is his critique of the 1972 campaign of George McGovern. He argues that this moment marked the Democratic Party’s pivot away from working people and organized labor and into the embrace of the white-collar professional class. The McGovern campaign, mistake-plagued though it was, had an admirable platform that called for full employment, a guaranteed minimum income—well above the poverty line—and a redistribution of wealth through a new system of taxation. McGovern had long been a proponent of universal health care. He called for a union-like organization to be formed to advocate on behalf of welfare recipients. These were not concerns of the professional class. McGovern also stood up to the war industry. And, not unlike what is happening to the Republican Trump, the elites in his own party joined with the elites in the other major party to attack their own candidate’s campaign. The big problem for McGovern was not that he or the Democrats abandoned labor but that labor through the numerous anti-communist purges during the previous decades had been domesticated and turned over to Cold War troglodytes like Lane Kirkland, Walter Reuther and George Meany who worked overseas with the CIA to break radical labor unions. Organized labor, especially the AFL-CIO, embraced Richard Nixon’s war in Indochina. It denounced the hippies in the streets. Labor was transformed into a junior partner of capitalism. It was severed from its radical roots. And its ideological capitulation to capitalism, along with deindustrialization, doomed it to oblivion. McGovern’s last act of political courage was as chairman of the Select Committee on Nutrition and Human Needs. The committee issued a report in 1977 called the “Dietary Goals for the United States.” It warned of the health risks of having a diet rich in meat, sugar, saturated fat and cholesterol. McGovern hoped the report would “perform a function similar to that of the Surgeon General’s Report on Smoking.” His committee called on Americans to dramatically decrease their consumption of meat, dairy fat, eggs and other high-cholesterol sources. The animal agriculture industry went berserk. It exerted tremendous pressure to get the report rewritten to obliterate the health warnings. The committee was soon disbanded. Its functions were turned over to the Agriculture Committee, run by officials in the pocket of the animal agriculture industry. McGovern, like most liberal politicians who refused to sell out, lost his seat, ousted from the Senate in 1980 by a Republican cattle rancher. The destruction of radical movements, begun by President Woodrow Wilson, removed the pressure placed on the liberal class. Once our radical movements were destroyed, corporations decimated the tepid liberal class itself. No institution in America can any longer be considered truly democratic. And self-identified liberals, like every other participant in the political charade, act out their assigned parts to maintain the fiction of electoral politics, voter choice and a liberal democracy. But it is a charade. We must not, however, confuse the courtiers with the tyrants.